Only few days left for you to take advantage of this Christmas treat. MSI got you covered with up to P15,000 cash discount plus premium items as freebies upon purchase on select models. Give yourself or get someone the perfect gift this season. 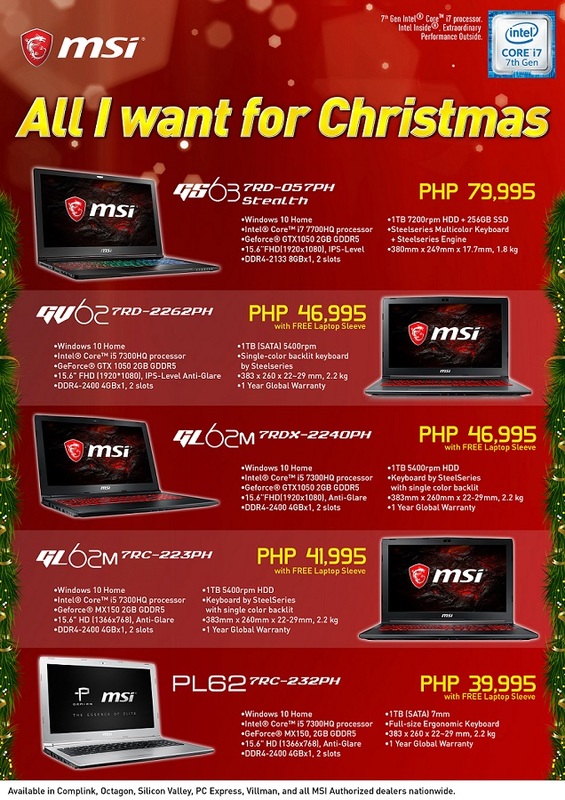 Offers last only until December 26, 2017, so visit the nearest MSI Authorized store near you now! Enjoy the slimmest notebook as MSI includes GS63 7RD-057PH on the Christmas Season Promotion! Experience the overwhelming performance brought by Intel Core I7-7700HQ, NVIDIA Geforce GTX 1050Ti and MSI Cooler Boost Trinity under the hood. MSI Notebook GV72 7RD and above models are packed with powerful NVIDIA Geforce GTX 10 Series which povides better graphics. It comes with full HD Display panel perfect not just for the gamers but for professionals too.